What You Need to Know about Game of Thrones Direwolves? It may be April, the onset of great Indian summer but in Westeros, ‘Winter is coming’. Billed as the most epic TV series on the face of the planet, HBO’s Game of Thrones has legions of fans. The multiple award-winning medieval fantasy epic based on George R.R. Martin’s best-selling book series “A Song of Ice and Fire”, is all set for the fifth season. This dog, too belongs to the tribes who swear by Stark sigil. Given the dog that I am, the chosen house had to be Stark. Of the dragons, draconian lords and devils, the most alluring of all animals in Westeros are the direwolves (A pre-historic large breed of the wolf; Extinct in the natural world). As per those who chronicle the realm, Direwolves have not been seen south of the Wall for a very long time so when Ned Stark (Lord of Winterfell, House Stark) found a dead wolf mother and still-born pups, he lets his children keep them post Jon Snow’s persuasion that the Stark children were “meant” to have them as the direwolf is their sigil and there are exactly the right number of puppies in terms of gender and an outcast (Jon Snow and Ghost). 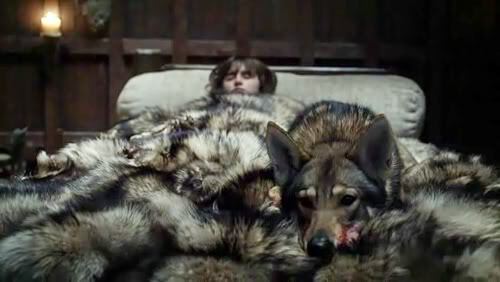 As the series has progressed we have learned that Bran and eventually all the other Stark children are wargs, (Wargs are people with the ability to enter the minds of animals and perceive the world through their senses and even control their actions.) Each of the Stark kids’ direwolves are reflections of themselves personality-wise. Many a times, fans are left putting (or shall I say pitting) theories against another theory – what if the fate of the Stark children and direwolves runs in parallel? And in most cases, it has. 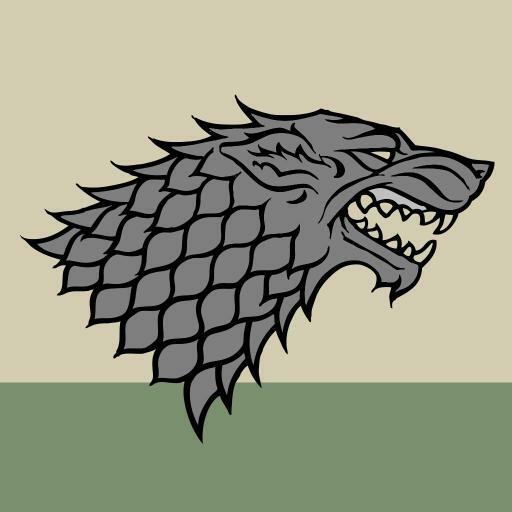 Direwolves and the Stark children: parallel paths? Jon & Ghost — Jon named his direwolf Ghost because of his white fur and unnaturally quiet demeanor for a wolf. One of the most fan-favorite moment of season 4 was Jon’s reunion with Ghost in the far north. Jon and Ghost are perhaps the most relatable of the Starks and direwolves pairs. Jon, an illegitimate child is different from the lineage of Stark and Ghost, a snow white wolf was different from the others. Jon smiled. “You’re the one deserves an honor,” he told the wolf… and suddenly he found himself remembering how he’d found him, that day in the late summer snow. They had been riding off with the other pups, but Jon had heard a noise and turned back, and there he was, white fur almost invisible against the drifts. He was all alone, he thought, apart from the others in the litter. He was different, so they drove him out. Ghost was a part of Jon Snow. No, if you ask this dog. Warg is the answer and if you’ve read the books, pay attention to Jon Snow’s last words, ‘Ghost!’. Bran & Summer —Bran and Summer have been together the longest, and they have forged a great bond. 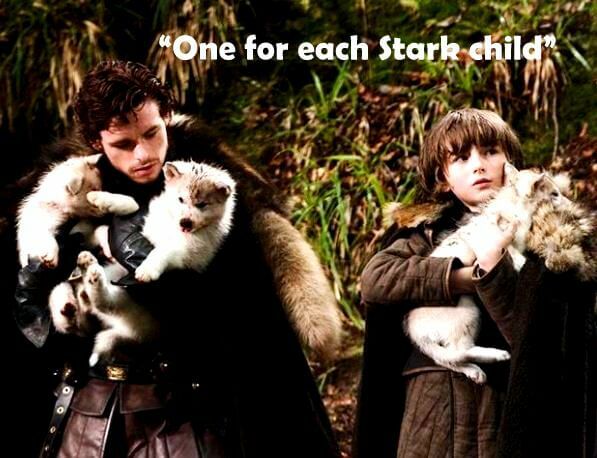 Perhaps the other Stark children, if reunited with their direwolves would have a better foreseeable future in the realm. When Lady Catelyn Stark struggled to fight off an assassin sent to kill Bran, Summer leaped into action and tore out the man’s throat. Afterward, Catelyn looked on in astonishment as the direwolf simply curled up next to his master and watched over his bedside. “And who is Summer?” Jojen prompted. Summer sits next to Bran, after saving him from an assassination attempt. Arya & Nymeria — Arya named her wolf after the Rhoynar princess who sailed across the Narrow Sea to Dorne and effectively laid the foundation of the current ruling house of Martell. One of the saddest sights in #GOT was to see Arya bid adieu to Nymeria. Stranded, Arya Stark is learning to become an assassin but she still dreams/lives through Nymeria in Westeros. Here’s hoping that season five sees this untameable pair reunited! Nymeria defends Arya and her friend but has to go wandering to avoid the blades of the Lannisters. Update: So season 7, episode 2 actually had the reunion! Albeit a brief one. Robb & Grey Wind — Robb named him Grey Wind due to his fur colour and his speed. Unfortunately both Robb and his wolf met their end at the Red Wedding. Grey Wind however, did serve his human to help him stand as The King of the North before their tragic end. Grey Wind died saving Robb Stark (in vain). The North remembers his sacrifice. Sansa & Lady — True to her name, Sansa Stark’s direwolf was the perfect little lady. Sansa Stark’s dire wolf Lady met an untimely end as a sacrifice to mollify the queen’s anger after Arya’s dire wolf Nymeria bit the evil Prince Joffrey (and then ran away). With the untimely demise of Lady, Sansa’s storyline has also taken a morose turn – first the Lannisters and now Petyr Baelish. Sansa and Lady, both are met grim times. 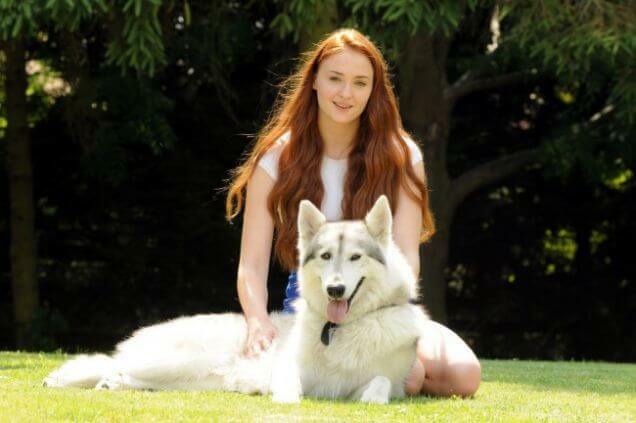 Sansa Stark (Sophie Turner) adopted her direwolf Lady from the Game of Thrones. In real life, however, Lady’s doing much better — especially after actress Sophie Turner adopted the dog who played her. 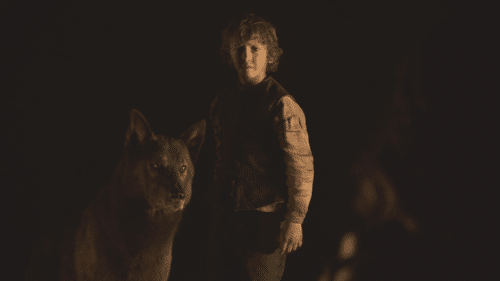 Rickon & Shaggydog — We know they are in Skagos (a land of cannibals) along with Osha, a former wildling as of book 5, the fans are left wondering if they’d turn to the feral side? Rickon and Shaggydog, none can’t be tamed. As the madness and its methods resurface in a week, here’s hoping the Starks and the wolves have it good this time around. There will be dragons wrecking havoc but remember if you must, DireWolf shall reign supreme and winter is coming, of course. Posted on April 5, 2015 September 6, 2017 Author Abhishek JoshiCategories Dogged reviews! So are you trying to say Ghost is dead in the series too? Because the actual wolf who played Ghost died in May. And that sort of broke my heart. Previous Previous post: Hachiko Reunited with his human! Next Next post: What’s it like Living with Himalayan Mastiff dogs?